When thinking about a road trip through Africa, Namibia is most likely on your list. And there are plenty good reasons to visit Namibia on a road trip. I’ll never forget my first encounter with Namibia. This beautiful country surprised me on so many levels. Here are 13 reasons to visit Namibia; not necessarily in that order. 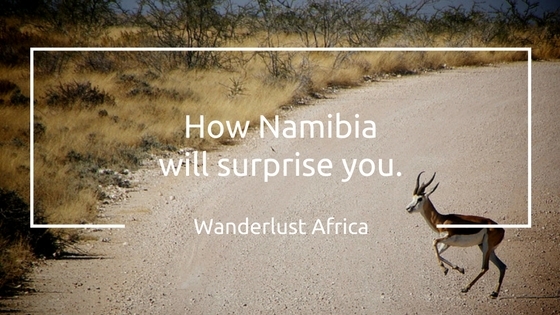 Which will be your favorite reasons to visit Namibia? Namibia – once known as German South West Africa – was a German colony between 1884 and 1919. Although I knew this, I’d never expected it to be so errrr… German! 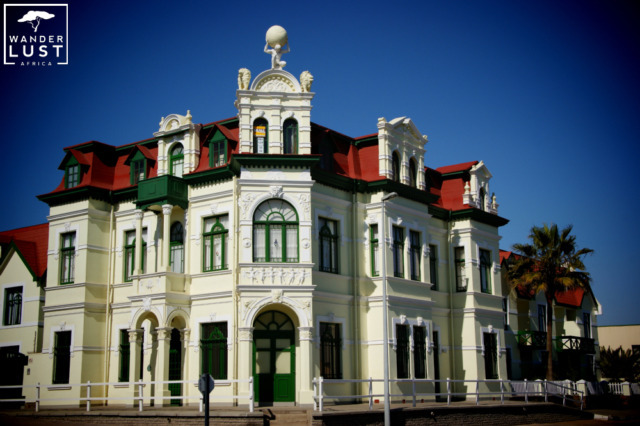 Walking through Swakopmund made me feel like strolling around a traditional German village. I think Swakopmund is THE most German town in Namibia. It’s not only the many old buildings that are evident signs of the German colonial legacy in Namibia; such as the Kaiserliche Bezirksgericht (State House) or the Hohenzollern Building. It was also the many street signs in German, the typical half-timbered buildings and a beer garden with Erdinger Weissbier that made me think of home. One thing that completely threw me was the ringing of church bells at noon indicating lunchtime! Something I haven’t experienced anywhere else; and it’s typical German. So if you’d like to combine a German holiday with a trip to Africa, go to Namibia – you kill two birds with one stone. Having traveled through 17 African countries, I may say that Namibia’s infrastructure is one of the best. Its road network is well maintained connecting all major highlights. Namibia is definitely a wonderful destination to be explored on a flexible self-drive. You should not underestimate travel distances though. Namibia is a vast country and travel times can be underestimated – especially when coming from Europe, where 400km can easily be done in a couple of hours. Plan your trip well! Remember it’s supposed to be a holiday; you shouldn’t feel like you are on the run. Because of an extremely dry climate and a low light pollution, Namibia’s night sky bursts with a million stars. It’s an amazing feeling to see the Milky Way above you and to think you can touch it. I love the Namib Dune Star Camp. Roll your bed onto your private deck to allow for safe sleep-outs under the stars. A rather civilized form of camping but nonetheless exciting. Namibia’s fiery red sand dunes are famous and the most photographed dunes in the world! A climb of Dune 45 or dune running on Big Daddy is a truly wonderful experience. Namibia is more than ‚just’ sand dunes though. There’s the fascinating Fish River Canyon, a gigantic ravine about 160km long and 27km wide! In some places it’s almost 550m deep. 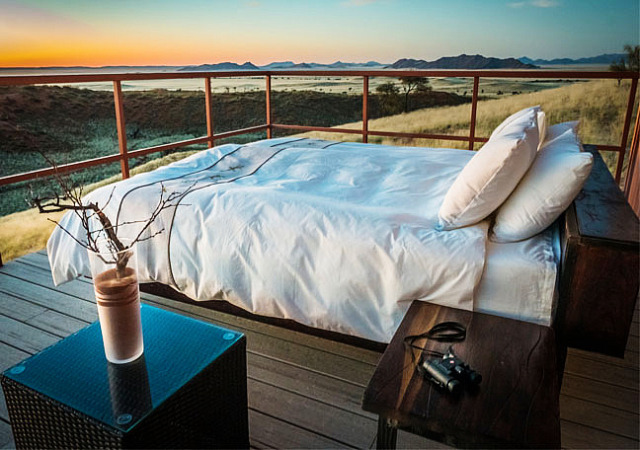 It’s a great spot to watch a Namibian sunset. Another stunning canyon to explore is the Sessriem Canyon on your way to Sossusvlei. And if you’d like to see some quirky trees, then Quiver Tree Forest in Keetmannshoop is the place to be. 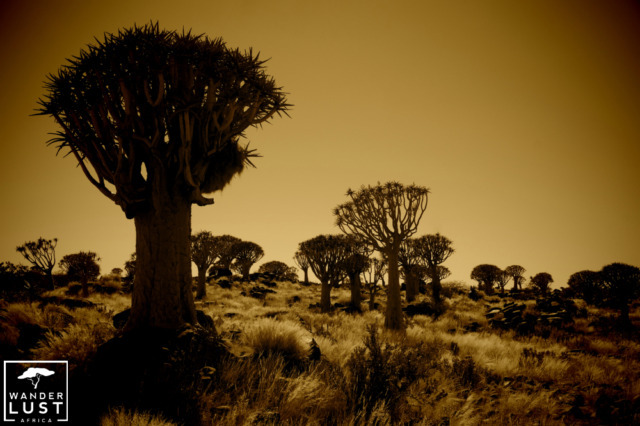 The Kokerboom is one of the most characteristic plants of the Namib. Well, not all women but the women of the breathtaking Himba Tribe. To stay fresh and clean, they burn the commiphora plant and cover the body under a blanket. The smoke opens and cleans the pores. They then moisturize their body with a red paste of ochre and butter; hence the beautiful earthy red skin color. Amazing right? And who would have thought that their body odor is a lovely earthy scent. If you are interested in culture than the opportunity to meeting the Himba is enough reasons to visit Namibia. Traveling around Namibia is simply amazing as you are escaping the crowds. Namibia’s population density is 2.8 people per square kilometer. So once you leave towns and national parks, you’ll have the feeling of being the last person on earth. It’s not unusual to see no other cars on the road. Make sure you visit Solitaire; definitely an uncrowded place with a population of only 92 or something like that. Still it has the best bakery in Namibia; the famous apple pie and the old car yard are definitely worth a stop on your way to Namib-Naukluft National Park. Escaping the crowds is one of my top reasons to visit Namibia. Safaris in Africa are generally speaking not a ‚cheap affair’. That’s what I love about Namibia – here you’ll find a fantastic choice for all budgets. A lot of travelers explore Namibia on a flexible self-drive road trip, which is also a good choice for budget conscious guests. If you are pressed with time, a luxurious fly-in safari might be the better option to see the Natural Wonders Namibia. The bonus is that you can marvel at Namibia’s attraction from above. If you prefer the road option, but don’t want to drive yourself then a private guided tour is easily arranged. In regards to accommodation, Namibia offers everything from charming B&Bs and idyllic guesthouses to fine hotels and luxurious safari camps. The choice is yours. Sure, when thinking about wildlife encounters Kenya and Tanzania has covered it all. Don’t dismiss Namibia though. 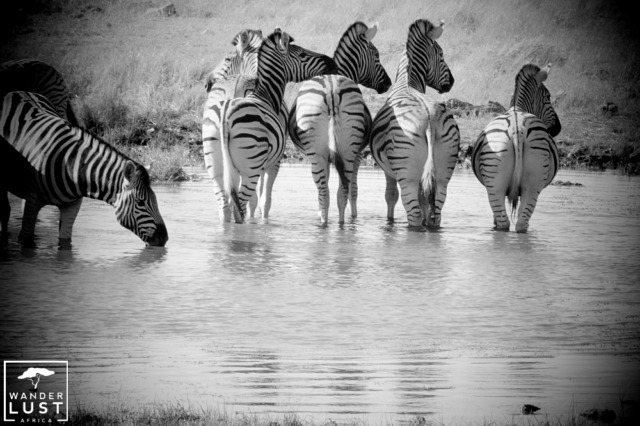 The water holes at Etosha National Park make for some breathtaking wildlife encounters. You won’t have a hard time to find lions, many zebra and giraffes. If you prefer a trip off-the-beaten-track, I recommend a visit to the Skeleton Coast. Only 800 visitors yearly are allowed to visit this bleak but beautiful coast in the most remote region of Namibia. The coast is littered with whalebones and crumbling shipwrecks. For amazing photographic opportunities head to ghost town Kolmanskop. In its days of glory it was a little vibrant town that was established during the diamond rush. This now abandoned old town is eaten up by the mighty sand dunes of the Namib Desert. Who would have thought that there’s so much life in the desert? Be prepared for an amazing adventure when searching for the Little Five. Watch the Dancing White Lady Spider doing cartwheels to escape the enemy; apparently 44 turns per second. Did you know that the webbed feet of the transparent Namib Dune Gecko are an equivalent to snow shoes? It helps the gecko to walk across sand without sinking in. Also keep an eye out for the Shovel-Snouted Lizard and the Sidewinder Snake. Sounds intriguing, doesn’t it? If you are an active traveler than you’ll love Namibia. It’s a fantastic destination offering everything from light walks to challenging hikes. A lot of camps offer superb walking trails to explore the surroundings – either on your own or with a guide. 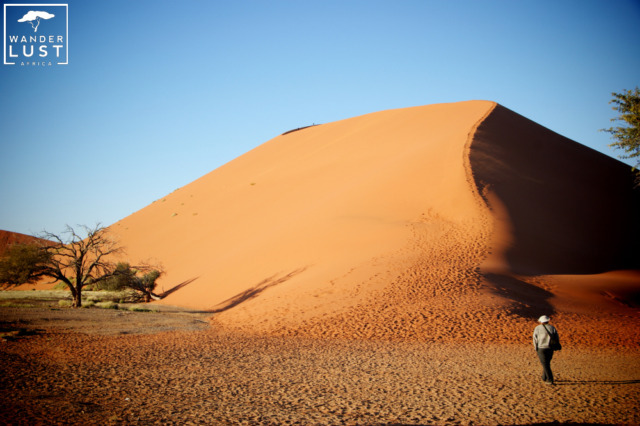 The Tok Tokkie Trails is a beautiful three-day hike to get close to the Namib Desert. 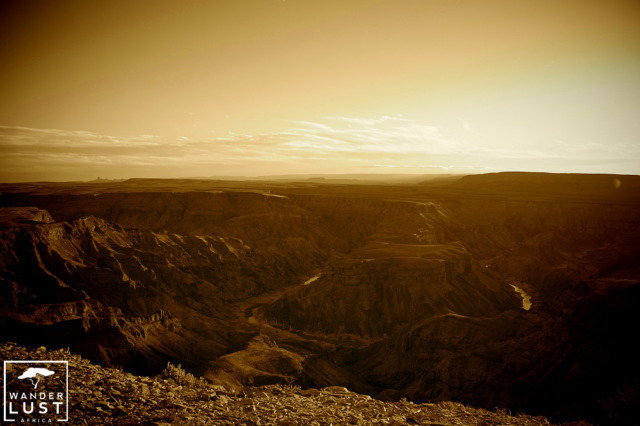 Fish River Canyon is also a fascinating spot. The Fish River Lodge is offering fantastic hiking packages with experienced guides and of various lengths. Note that hikes are only taking place between April and September. If danger is your middle-name, you’ll find multiple ways to pump up your adrenaline! From sky diving, paragliding and scenic flights to sand boarding, quad biking and dune carting; in Swakopmund you are spoilt with choice. If you prefer it a bit less hectic, then perhaps do some horse riding or go on a dolphin cruise. If money and time don’t matter then Namibia is the ideal location to combine your trip with other countries in Southern Africa. There are direct flights between Windhoek und Maun – ideal to add a water safari in Botswana to your desert experience. If you’d like to relax at pristine beaches then head over to Mozambique. You only need to add a one-night stopover in Johannesburg. And if you’d like to do some shopping in vibrant Cape Town, then hop on a direct flight from Windhoek to the mother city. To sum it up: I wouldn’t offer Namibia to someone looking for a quintessential safari experience. But Namibia is a fabulous destination for everyone who enjoys untouched landscapes and unique cultures. Browse through our inspirations for Namibia Holidays. I’m only a pone call away to plan a memorable trip for you. Have you been to Namibia? What are your reasons to visit Namibia?